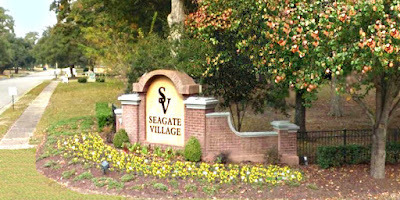 For many years the homes of Seagate Village were part of the housing for military families on the Myrtle Beach Air Force Base. When the base was closed, the large community of small single family dwellings was remodeled and updated into one story “condos” offering some of the biggest bargains in Myrtle Beach. These bright and airy 1 – 3 bedroom units have refrigerators, stoves, dishwashers, washers, and dryers. Many have large yards with decks and carports. Some are even furnished. Depending on size and upgrades, prices run for less than $100,000 to just under $200,000. The best thing about owning a Seagate condo is the convenience. Horry-Georgetown Technical College is just a short walk away. Myrtle Beach State Park is right across the street, featuring a gorgeous beach, picnic areas, limitless nature trails, and a pier. There is a fitness center nearby and there are several parks within the Market Common community, as well as the unique shopping, dining, and entertainment options in the Market Common retail district. This is an opportunity to be a part of one of the most exciting and fastest growing communities in Myrtle Beach. Visit our website to learn more about the beautiful condos for sale in Seagate Village! Call our real estate professionals today for a private tour.